In the unincorporated community of Claxton, Tennessee sits a two-story log cabin built in the 1790s. The cabin, the county’s oldest building, was built by a Revolutionary War veteran named David Hall. He had fought against England, where the Industrial Revolution was well underway by the 1770s. When Hall got to Tennessee, the region was a backwoods territory of the young republic. Hall built his cabin with wide, rough-hewn pine logs. Hall had probably heard of the growing energy source known as coal. But of course he couldn’t know that one day a coal-burning power plant would sit within view of his cabin, or that the utility that owned the plant would want to buy the land to store its growing pile of coal waste. Photo by Appalachian Voices Site of the Tennessee Valley Authority coal ash disaster in March 2012, over three years after the spill. TVA plans to convert all of its ash storage to dry instead of wet sludge, but that will require a lot more land. Last year, the Tennessee Valley Authority proposed just that. It also proposed to buy another 30 properties in the small community so it could store toxic coal ash from the Bull Run Steam Plant. After TVA’s 2008 coal ash spill, the utility committed to converting all of its ash storage to dry instead of wet sludge — the kind that gushed over 400 acres of land between Christmas and New Year’s. The irony is that although dry storage will be safer, it will also require a lot more land. Whether TVA is destroying communities by unintentional spills or by intentional buy-outs, rural Tennessee continues to be ripped apart by the nation’s largest purchaser of coal. Last month it was reported by The Knoxville News Sentinel that while TVA didn’t force the owners of the historic David Hall cabin to sell out, it did convince 24 families and the owner of a 118-acre horse farm to give up their land for a new coal ash dump. “It’s just progress, I guess,” said William Banks, a Claxton resident who sold out. But he didn’t sound convinced. The resignation in his voice seemed to ask: Is dumping harmful heavy metals onto farmland really anyone’s idea of progress? Tennessee isn’t the only state that is losing land to coal waste storage. Even though the coal industry is on the decline as the percentage of coal-fired electricity in the US continues to plummet, the utilities still have a major problem with storing all of the waste they create. The nation’s coal-burning power plants produce 136 million tons of ash every year. So while land is being grabbed at an alarming rate for resource extraction, it’s also being snatched up to store the wastes from burning those resources. Missouri Sierra Club chapter director John Hickey says that Ameren Electric recently bought up farmland in the Missouri River floodplain so that it can build a 400-acre coal ash landfill next to Labadie, the state’s largest coal plant. 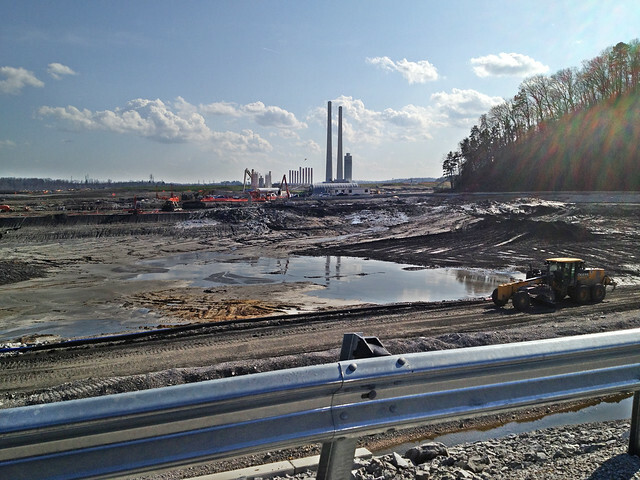 Last year, South Carolina Electric & Gas Company bought property in Colleton County and tried—but failed, due to a community uproar led by the Coastal Conservation League—to build a 1,000-acre landfill to store coal ash near the village of Canadys. At its plant straddling the border of Pennsylvania and West Virginia, FirstEnergy has bought land and is attempting to expand its Little Blue Run disposal site, one of the largest in the nation. The plant takes up 1,000 acres in Beaver County and burns about 7 million tons of coal every year. It produces 4 million gallons of coal slurry daily. A complete list would be much larger. But no matter the location, the story is the roughly the same: coal fired power plants are running out of room for disposing of their coal ash. Still, there have been small victories for environmentalists and concerned local citizens. In late May, the EPA decided to oppose a wetlands destruction permit from Louisville Gas & Electric. The company had proposed to store almost 1 million tons of ash along the Ohio River, which, according to the EPA, would have damaged as much as 10 miles of streams, 1.1 acres of wetlands, and .27 acres of ponds within the watershed. This was a bold move for the EPA, which has failed to make a final coal ash rule since it promised to do so just after the Tennessee spill. Back in Tennessee, residents of Claxton are moving out of the homes they’ve sold to TVA. The local newspaper said they are “now resigned to what seems inevitable,” although the majority of the community strongly opposed the expansion in the beginning. As Big Coal makes its final push to extract and burn every last bit of the energy source that powered the Industrial Revolution, David Hall’s cabin remains. Sitting in a rocking chair on the centuries-old front porch, one can see the smoke stacks of the Bull Run coal plant. The cabin, then, is both pre- and post-industrial, conjuring notions of the Romantic, the hand-built, the rustic, as well as of the ruin of the fossil fuel era, where a lone home will sit among the ashes.